On Friday I got to check out two of Tony Levin's shows. The first was in the afternoon with "Stickmen." This was my first time hearing the group live and I quite enjoyed it. 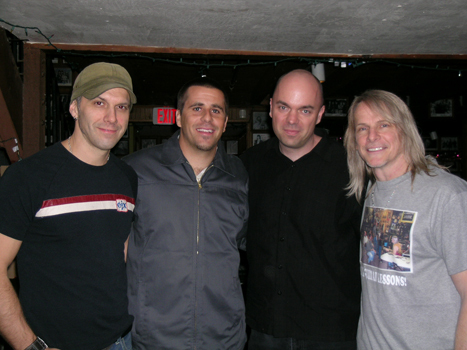 The set was a mix of new material, some things from Tony's "Stick Man" CD and a few King Crimson covers. They really take advantage of the fact that it's not necessary for them both to be playing two distinct parts at once. The result is that they can use two hands each to do things that say a solo Stick player would never tend to do. And P@t on drums.. amazing as always. His use of electronics and loops is as good as it gets. He added many nice textural bits that gave a huge stereo spread to their sound while the Sticks remained more centered in the image. He was even triggering a few Stick loops along the way! Friday night I also got to check out a Sabian show featuring Terry Bozzio, Tony Levin, David Torn and Pat Mastelotto. Before they started, Terry said hello to the crowd, thanked them for being there and then apologized saying that the group was about to throw a "wet blanket" on the evening with some really weird music. Ha! They went on to play one piece, all improv for 45 minutes. The group was very dynamic, creating "softer" moments that were quite different from the "heavier" moments. 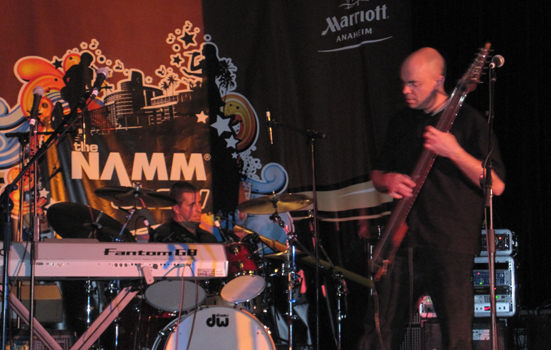 The music was definitely "out" and probably too unusual for many a NAMM attendee to compute, but it had some great moments. 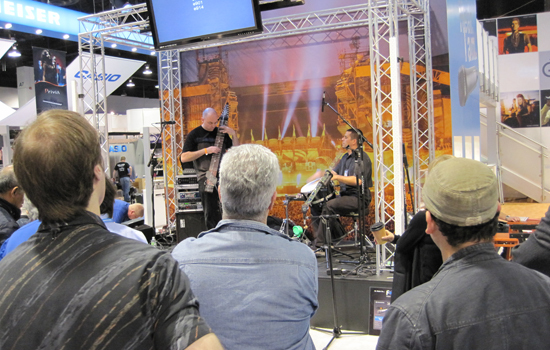 Sunday afternoon, Agent 22 played the last slot at the Sennheiser/Neumann booth. They've been featuring mostly local singer songwriters in recent years on this stage, but had a few cool acts before us, including Ricky Skaggs (who had an awesome bluegrass style guitarist with him) and a wild string quartet called the Sonus quartet. It was good to see a few other Stickist make it out to our set here, including Linda Cushma and Dave Tipton. Dave had a funny comment. He said during our set that he overheard a conversation that went: "What's that instrument he's playing?" "It's a glass didgeridoo." Ha! Well done Rymo! Like I said earlier... "whew!" 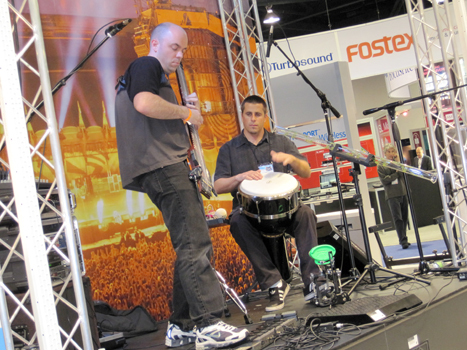 And yes, that's the summary of NAMM 2010.